Poor Patisserie Valerie has now been placed in administration and buyers are being sought to rescue as much as possible of this previously thriving chain. We now bring our readers up to date on this sorry saga. In our article in early November, we chronicled the events leading to the horrifying discovery at Patisserie Valerie in early October that the Inland Revenue were petitioning for the company to be wound up for not paying its debt to HMRC, and worse that they had no money to pay it anyway. Horrifying for the Executive Chairman, Luke Johnson, and horrifying as well for the investors who had backed it after its listing on AIM in 2014, and watched happily as its value rose nearly threefold over the next four years to approach £450 million. In short order, Mr Johnson arranged an emergency financing, kick-starting it with a £20 million loan from himself, and fended off immediate disaster. However, the shares were suspended while investigations commenced into what had gone so catastrophically wrong when the audited accounted had shown no problems, and there had appeared to be a steady increase in revenues, profits and cash flow. Questions were directed at the Board, the auditors and the regulator. Auditors, Grant Thornton, stepped down, PwC were tasked with investigating the true underlying situation, the Financial Reporting Council and the Serious Fraud Office both got involved, and in quick succession, the CFO and CEO both disappeared. The refinancing, through which Luke Johnson repaid most of his emergency loan, was itself criticised, as being a private placing rather than a general offer (understandable, perhaps, in view of the urgency of the situation). Moreover, the terms of the placing relied on the very little information that was available at the time. Hence the selected investors in the private placing were dependent on estimates of the damage that was likely to be caused by the as yet unsolved £40 million hole that had suddenly appeared in the accounts. Mr Johnson and his investors must have been hoping that after the refinancing, they would soon wake up from that October nightmare. Sadly, it evolved into a waking nightmare, as the PwC investigation proved unable to produce quick answers, but disclosed a problem of increasing complexity, and in the background, the SFO and FRC investigations continued to simmer. By Christmas, a new CEO had arrived, followed by an interim CFO, and a new Group Commercial director had been appointed. 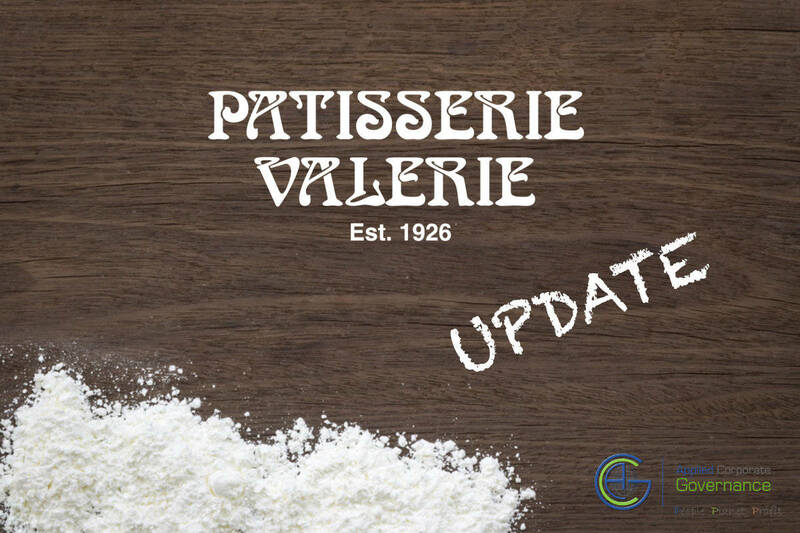 Everyone concerned must have hoped that stability had arrived and Patisserie Valerie could start on the long road to recovery. However, January brings the snow, as the saying goes, and two other directors resigned, as the CFO announced that it would take six months to sort out the outstanding invoices and payments. The timing didn’t help as a major refinancing was due in the middle of the month, and the banks were being asked to renew lending facilities against a background where the company admitted that it hadn’t much of a clue about its underlying financial position. Unsurprisingly, when the moment came, they declined to put more money forward, and Patisserie Valerie was put into administration. Controversy followed even at this point, as the lead administrator was KPMG, who had earlier in the month been appointed to look at options for Patisserie Valerie to escape from the mess it was in, and they were currently supplying services to others of Luke Johnson’s business interests. So cries of “cosy deal” went up from damaged investors. Which brings us up to today, where the struggling administrator has asked for offers for all, or parts of the business, but faces the same problem as the banks. Until someone works out reliably what the business is worth, it is very difficult for anyone to put in a bid. By way of illustration, just prior to administration, the company made an announcement to the Stock Exchange that there appeared to have been thousands of false entries in the books of account. The result was that, compared with a September 2018 forecast of £30 million profit for the year to 30 September 2019, which had been reduced to £15 million for the emergency fund-raising in October, the latest estimate was £12 million. The company now faces being broken up and sold in pieces, and the shareholders have almost certainly been wiped out – particularly galling for those who supported the emergency placing in October on the back of ill-founded trading estimates. So now the search for scapegoats starts in earnest, and vultures circle. In our earlier article, we talked about the importance of the Board being on top of the day to day performance of the company, and the role of the auditors in picking up significant aberrations which could point to big mistakes or even fraud. Regarding the Board, the CEO and CFO departed early on, with the CFO actually being arrested and released on bail. One assumes that the SFO will pursue its fraud investigation diligently and won’t trip over the related regulatory investigation by the FRC into the auditor, Grant Thornton. The latter’s case was surely not helped by the defensive remarks of its newish chief executive to a committee of MPs that “we are not looking for fraud …. and we are not set up to look for fraud”. The committee of MPs was not impressed, and neither were several other senior members of the accountancy profession. The directors generally would seem to be in the firing line, and Luke Johnson, as self-described executive chairman, looks particularly exposed. The general duties of directors are set out very clearly in Section 171 of the Companies Act 2006, and they are required by the Act to exercise reasonable care, skill and diligence. Certainly the insurers providing their professional indemnity cover will be considering this, as will their own lawyers, and the lawyers acting for the prospective group action against the company, as the company’s internal investigation progresses. As with the accounts mis-statement at Tesco, it seems extraordinary that the board should have been taken by surprise by finding out that its declared trading numbers were way off the actuality. In Tesco’s case, as we pointed out in our article on the subject, the situation wasn’t helped by a lack of retailing expertise amongst the non-executives, but in the case of Patisserie Valerie, Luke Johnson might not have been a champion cake baker, but he was a specialist in this field of retailing. A Financial Times analysis suggests that the declared operating margins of Patisserie Valerie were much higher than those of its peers, which should surely have prompted particular attention from the Board. And it was reported that the company was stretching its payment terms with suppliers to the point where some were taking legal action. Surely extended payment terms would ring warning bells with directors. One of the final ironies in this sad tale is that the transformation of the last few years’ accounts is likely to produce big losses instead of the previously declared profits. As a result, HMRC, who pulled the first thread that caused the unravelling of the business, is likely to have to give back a much larger sum in regard to overpaid corporation tax than the amount it was claiming in October 2018. What lessons can we draw from this tale which might have prevented this disaster? Well, as we put forward in our earlier analysis, a stakeholder communication system which provided a permanently open and secure channel from the key business partners to the chairman and the board, would surely have brought to their attention the creation of thousands of fictitious invoices (if that was indeed going on). And the opening of huge new borrowing facilities would certainly have been discussed with the executive chairman, unless collusion happened with the bank staff concerned, which seems improbable. Similarly, the property companies whose lease payment were being delayed would complain to the chairman, as would the officials at HMRC who were contemplating applying for a winding-up order. Whistle-blowing is being encouraged by the authorities, but far better to install a system such as we have been advocating for many years, to make it easy for boards to exercise good corporate governance through reliable connection with their stakeholders.